Describing America as India's "natural global partner", Prime Minister Narendra Modi said the complementary strengths of the two democracies can be used for inclusive and broad-based development to transform lives across the globe. "The US is our natural global partner. India and the US embody the enduring and universal relevance of their shared values," Modi wrote in an op-ed in The Wall Street Journal. 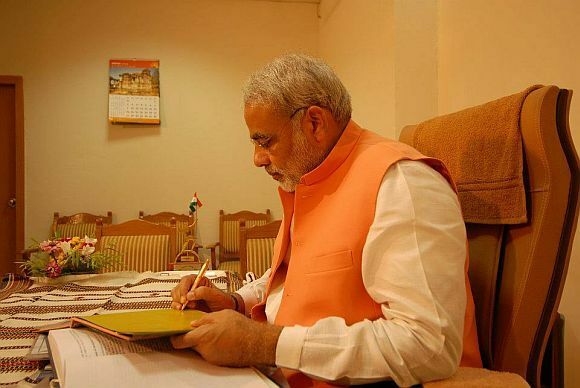 He promised to eliminate unnecessary laws and doing whatever it takes to make his "Make-in-India" campaign a reality. "In the coming months, you will feel the difference even before you begin your travel to India," PM Modi said promising to make India "open and friendly" for business, ideas, research, innovations and travel. He said the thriving Indian-American community in the US is a metaphor for the potential of India-US partnership, and for the possibilities of an environment that nurtures enterprise and rewards hard work. Ahead of his arrival in New York for a five-day US trip, the PM said India and the US have a fundamental stake and many shared interests in each other's success. "That is also the imperative of our partnership. And it will be of great value in advancing peace, security and stability in the Asia and Pacific regions; in the unfinished and urgent task of combating terrorism and extremism; and in securing our seas, cyber space and outer space, all of which now have a profound influence on our daily lives," he said. Modi said the complementary strengths of India and the US can be used for inclusive and broad-based global development to transform lives across the world. "This is a moment of flux in the global order. I am confident in the destiny of our two nations, because democracy is the greatest source of renewal and, with the right conditions, offers the best opportunity for the human spirit to flourish," Modi said.